Back in 2016, JD.com turned its hand to revolutionizing a whole new industry: raising chickens. With the launch of its “Running Chicken” initiative, JD established a free-range chicken farm in China’s economically disadvantaged Wuyi County, in Hebei province. The program has gone on to reduce poverty in one of the country’s historically poorest regions while providing top-quality chicken meat to discerning shoppers on the JD platform. It has been a resounding success, with sales of the free-range chicken products doubling on JD in its first two years. The 27-hectare “Running Chicken” farm exemplifies JD’s commitment to both giving back to society and providing goods of unmatched quality. By offering interest-free loans to farmers, the program has helped nearly 500 families in the area earn thousands of RMB per year, improving their quality of life and helping to remove Wuyi County from China’s national poverty list. Professional breeders hired by JD take the lead in tending to the chickens, while local farmers are offered part-time jobs maintaining farms and growing vegetables, fruit and grain for chicken feed. Chickens raised on the JD farm also provide a more ethical and healthier choice for consumers in an industry dominated by “battery farms,” where animals spend their lives caged in windowless sheds. Free-roaming chickens spend at least 50 percent of their time outdoors, so they can exercise in fresh air and sunshine and interact with other chickens. Studies have shown that free-range chicken meat can have lower levels of harmful cholesterol and saturated fat and higher levels of beneficial omega -3 acids, beta-carotene and vitamins A, B and E.
JD fits each chicken with a specially designed pedometer, with the aim of having each bird take one million steps during the rearing process. The company uses blockchain technology for maximum quality assurance and full traceability. Since early 2018, JD customers have been able to review details about the rearing process for every chicken they buy. A scan of the QR code on the poultry’s packaging allows buyers to view detailed information on sourcing, feeding intervals and more. 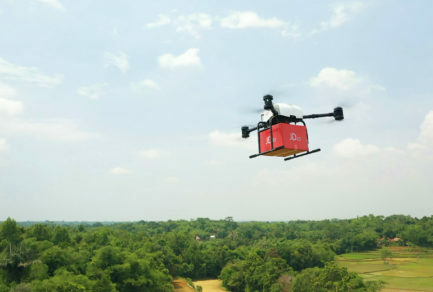 The chickens are delivered via JD’s self-operated logistics network, which covers 99% of China’s population and offers same and next-day delivery to most customers. Following the chicken project’s initial success, JD has expanded its philanthropic reach and range of premium produce by launching two similar farm-to-table initiatives: “Swimming Duck” in Jiangsu Province and “Flying Pigeon” in Hebei Province. Since 2012 JD has also opened more than 200 Poverty Alleviation Local Specialty Malls on JD.com covering 25 provinces. The malls help promote and market local agricultural products on a national scale, both benefitting disadvantaged farmers and providing access to more locally-sourced products for consumers.